Crime fiction is something I love to read. To solve a mystery, to see if I can follow in the detective’s footsteps and make sense of the case file, to become a detective for a little while… that’s quite fun. I’ve read a few detectives from Indian fiction, but when this book came to me for review, I was intrigued. A detective who solves cases by looking at and to the stars? Now there was something different, something to look forward to. When a student of astrology and criminology decides to start solving crimes, it would only be natural that she feels a mix of both would work wonders in solving crime. A novel idea, but would it fly in a country where people are so obsessed with the stars? Initially it doesn’t. It brings her more prank calls than proper cases. I wonder if it was in the stars that a feline would find the way for her to get a case. An attempt to find a stray cat’s owner brings her a case, and that gets her (, and her perky assistant Jatin) going. I’m no astrologer, or criminologist. The closest I’ve come to being the latter is trying to deduce the culprits in CSI before the actual ending is revealed. So to have a mix of both in a book was kind of fun and kind of boggling. The detection is fun, and the astrology talk boggling. However, the author’s attempt to make crime fighting seem easy when the stars are aligned in the protagonist’s favor (forgive the pun) works out fine. 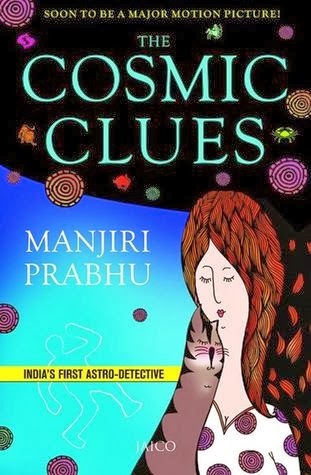 Easy language, light-reading, witty and humorous… the Cosmic Clues is a treat at times. It’s not so interesting that it’ll become a collector’s copy, but it’s a one-time read that’s sure not to leave you disappointed. Manjiri Prabhu is an Indian author who has written six novels and a non-fiction. She has been writing since she was seven years old. By profession, Manjiri is a Children’s Television Producer and a short filmmaker for over 20 years.